Maria's Space: How To Find Yourself Again! How To Find Yourself Again! This self help book isn't necessary for moms. There are tips and suggestions that anyone who wants to live their best life can benefit from. How many of us really know ourselves? I feel as if I know myself however that didn't happen until I was in my mid 30s. BUT am I living my best life? The answer is NO! There is so much more I want out of my life and I believe Amanda Mawhinney's Finding Mom is a great way to start. It is not that I don't have me time. I do. My kids have been used to me being "unavailable" from a young age. As a blogger especially in the beginning, I spent a lot of time on the computer and have mapped out time for me. Getting time alone is not the problem for me. I have passion, tranquility and many opportunities to do what I want to do. Now I just have to do it. Amanda's book breaks everything down. First she talks about taking time for yourself. Mapping out that "me time" and making sure you get it. Being a Mom is the most important thing to me for me there is nothing else. 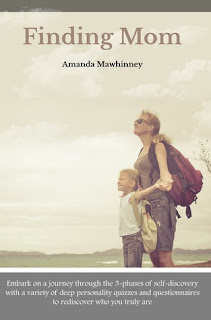 Amanda explains why it is so important to be MORE than a MOM. Being the best me is good for me and for my family. Family Personality Questions and how these different personalities interact which was probably my favorite part of the book and extremely useful. There is even a breakdown of the different personalities like whether you are people or task driven. A Director, Influencer, Manager, Satisfier or Helper. Like for instance I learned my husband is a manager and I am a satisfier which isn't a bad mix unless they are not communicating enough. After reading thoroughly the description of the two personalities together, it is completely accurate in my opinion. particular subject or upcoming event." The book is laid out in a easy to read, self help format that and real language that you don't need a doctorate to read. If you buy yourself one book this year; make it this one! Disclaimer: I received a complimentary e-book for my honest opinion. . My reviews are 100% honest and true based on my personal opinion not on a company’s description or request. I am not employed by any company I review for. No monetary compensation was received.